As Ayn Rand once wrote in her book in Atlas Shrugged, “man exists for the achievement of his desires” However, we only have one life to live and this is your opportunity to create a legacy and give back to the causes you care about. Let our team help you make a difference without building a legacy of dependency and entitlement. Through our proven growth methods and system implementation, you can scale your business and create systems and checklists that allow you to have peace of mind that your business can continue to grow without you running every aspect of it. If your goal is to grow as a business, while increasing your free time and achieving all of your financial goals, we are the team for you. With decades of combined experience building wildly successful businesses, our team at Redmond Growth is all about how we can best help you grow and get the most out of your business, free time, and life. Systems are simply the way things are consistently done. There are good systems and bad systems. Even if you don’t have an established, documented system for an activity like sales, cash management or education, a system, as chaotic as it might be, a “system” has still been created by default. It is one of the most effective aspects of my Tulsa business consulting processes. Although it takes a number of Tulsa business coaching sessions to create, test, measure and modify, if the CEO and his executive team are patient with this process, it produces huge results. Business growth flows from well-organized systems. Business losses flow from non-existent or chaotic, poorly defined systems. You may think, “Systems? Really? Who has time to create systems?” Others might think, “I’m not into systems. I am the creative type. Systems are too confining.” If that is you in either of these cases, are you happy with the results you are getting? This is the language poor or financially struggling people use. Since you have reached a level of sales that only 4% or less businesses ever reach, you’ve done many good things. When I provide you your business evaluation as your Tulsa business consulting expert, there are many Tulsa business coaching sessions that we will not have to cover because of your many strengths. However, some of the busiest people and the most imaginative people I know consistently reap increased revenues from what they create because they work through established systems. Yet, I have seen some very talented people struggle because they have not learned how to build systems to support and enhance their work. I want to let you in on a little secret. God loves systems! When He created the heavens and the earth, He wasn’t just creating a constellation of stars and planets. He was setting in motion systems of productivity, systems of order and abundance. Consider the moon, earth, stars, and the sun. We collectively call them the solar…system. We refer to our lungs, bronchi, trachea and diaphragm as a respiratory…system. We refer to our mouth, esophagus, stomach, intestines and colon as our digestive…system. You see, systems were in the mind of the Creator from the very beginning of time. That is because God thinks in terms of order, and the degree of wealth or poverty in our lives has much to do with the effectiveness of the systems we choose to set up or ignore. No systems; no order. Ignore opportunities and they go away. I started asking him questions about what was going on within his company’s structure so I could identify what might be blocking growth. I asked him, “With $5 million gross revenue per year, what is your net income?” What I was really after was the type of system he was using. I wanted to know if his current system was producing a healthy enough profit for him. He paused for a moment then cleared his throat. His hesitation confirmed my suspicions. He answered, “Well, we are actually losing about $500,000 a year.” This meant he either had a faulty system in effect, or worse, no systems at all. I started explaining the concept of “first be fruitful then multiply” (explained in detail in the Power to Create Kit and Book) and the need to set up good systems to control money flow. I told him if he was going to allow me to coach him, he would have to decide right then and there if he felt he could follow my advice and trust me through the entire process without quitting. I asked him if he was willing to keep his gross revenue at $5 million until he could generate $500,000 dollars in net profit. I told him he would have to move from a bottom line of red to a bottom line of black in order to grow his business the right way. However, his plan had been to increase volume in order to bridge the gap between the red and the black ink. He didn’t understand for the process to work, we were going to have to set up a number of systems that would produce higher levels of profitability before we could expand the business. I planned to help him set up systems of abundance. I believe that we ought to follow God’s creative pattern. We have to copy what He does in order to value what He values. That is the guideline I follow as a Tulsa business consulting growth specialist – find the best practices and provide Tulsa business coaching on helping leaders apply them to their organizations. Unfortunately, my client refused. He insisted on increasing volume regardless of the margins. He thought this was the only way to increase profits. He didn’t consider that his costs of doing business were probably higher than they should be and his sales price wasn’t high enough to generate a profit. This means, that if he increased business without first fixing the leaks, his expenses would go up in direct proportion to the increase in volume, maybe more. The wheels are coming off the wagon before his journey begins! Very rarely does anyone successfully grow their business by expanding when they are currently operating at a loss. Operating losses usually reflect sloppy systems that produce even more losses that can destroy the business if the faulty systems are not corrected. How do you create good systems or correct faulty ones? You have to look at your business and personal life as a fertile garden that needs attention. Nothing grows without a seed. A seed can’t grow without dirt, water, and sunshine. Seeds can be choked out by weeds. in other words, you have to tend your business-garden and personal life-garden in order for them to be gardens of productivity and blessings and not gardens of unfruitfulness and lack. Now, I want you to understand this very important statement: Any organization— your business, your marriage, your body, your friendships – left to itself, unattended and without accountability and structure, will become disorganized, degenerate, and will move towards lack and some form of poverty. Tending the garden is a call to responsibility. The good news is that God loves systems and orderliness so much that He’s right there to work with us, to co- create, help, guide, and mentor us with the appropriate system for the appropriate environment. Ultimately, it is our responsibility to set up systems that multiply and produce abundance. Are you the kind of person who cares enough about yourself to set up good systems that drive success? This is one of the primary ways I help my clients accelerate the growth in their businesses – setting up, correcting, and fine-tuning their systems throughout the business. Effective systems are really working for us when they help us make sure the work is well done. How are the systems in your life working for you? You must really look well! Don’t be casual about it. Casualness creates casualties. 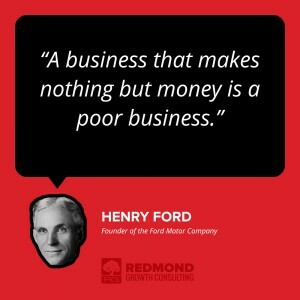 Tend to your business. Consistently follow up and follow through, making sure that your work represents the work of royalty, because that is who you are. On the other hand, what you don’t maintain, you lose. This applies to everything in life: finances, possessions, and especially relationships! Have you set up your primary systems for a successful life? These are systems I can help you set up in your business in my role as a Tulsa business consulting growth expert. All of these systems are directly tied into an even more important system, your Relationship Systems, whether they are business-related or personal. These six systems identify the components that govern the time you spend on relationships, how you nurture relationships, and how you maintain your business and personal relationships. Your work/life balance cannot be maintained in a healthy way unless you focus on your Relationship System. Please keep in mind, when you start creating or improving systems, you should always focus on one system at a time. Diluted efforts are doomed for defeat. Think about the one system that, if you could get it in order right now, would bring the most immediate, positive results to your life, purpose, and finances? In other words, which system will create the greatest “Wow!” factor for the people around you? Creating systems that “wow” is a never-ending process of improvement. Like the garden, they constantly need to be weeded, pruned, and sometimes pulled and replanted. Start where you are, be patient, and work on just one system at a time. What is one system that most needs your attention that you want to focus on improving? What is one step that you will take immediately to begin improving that system? This content was written by Tim Redmond – the Tulsa Business Consulting expert of choice of countless business owners. He specializes in providing Tulsa business coaching to dozens of companies in Tulsa, Oklahoma, and throughout the United States.